Former presidents and preachers joined a parade of singers Friday in a hip-swaying, piano-pounding farewell to Aretha Franklin, remembering the Queen of Soul as a powerful force for musical and political change and a steadfast friend and family member. In a send-off both grand and personal, a celebrity lineup of mourners filled the same Detroit church that hosted Rosa Parks' funeral and offered prayers, songs and dozens of tributes. Guests included former President Bill Clinton, former first lady Hillary Clinton, the Rev. Jesse Jackson, Stevie Wonder and Smokey Robinson. Robinson, the Motown great, remembered first hearing Franklin play piano when he was just 8, and he remained close to her for the rest of her life. They talked for hours at a time. "You're so special," he said, before crooning a few lines from his song "Really Gonna Miss You," with the line "really gonna be different without you." Late Friday, Franklin was laid to rest in a mausoleum at Woodlawn Cemetery, the final resting place of her father and two of her sisters. The epic funeral unfolded on the same day as services for Arizona Sen. John McCain in the nation's capital, creating a challenge for some news networks trying to show both ceremonies. The McCain memorial, with its reverential silence and ramrod-straight honor guard, contrasted sharply with the joyous remembrance in Detroit. Bill Clinton described himself as an Aretha Franklin "groupie," saying he had loved her since college. He traced her life's journey and praised her as someone who "lived with courage, not without fear, but overcoming her fears." He remembered attending her last public performance, at Elton John's AIDS Foundation benefit in November in New York. She looked "desperately ill" but managed to greet him by standing and saying, "How you doing, baby?" Her career, Clinton noted, spanned from vinyl records to cellphones. 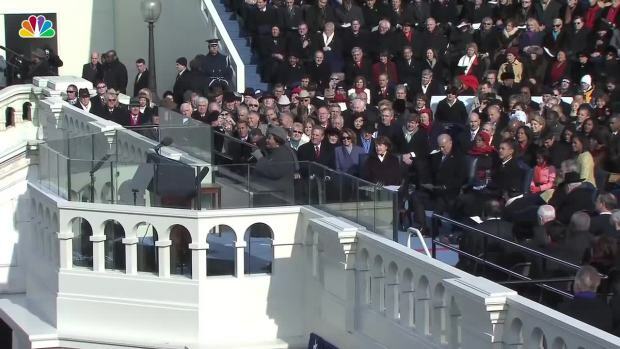 He held the microphone near his iPhone and played a snippet of Franklin's classic "Think," the audience clapping along. "It's the key to freedom!" Clinton said. Lasting just over eight hours, the service at Greater Grace Temple encompassed many of the same elements and emotions that were hallmarks of Franklin's more than six decades on sacred and secular stages. She was remembered as the pride of Detroit and a citizen of the world. Actress Cicely Tyson reworked the Paul Laurence Dunbar poem "When Malindy Sings" to "When Aretha Sings." Music mogul Clive Davis, who helped revive Franklin's career in the 1980s, described her as a loving friend and a dedicated and unpredictable artist, whose passions ranged from soul to ballet. He remembered her turning up at a tribute to him in a tutu. "There was the Queen of Soul, accompanied by members of the City Center Ballet Company," he recalled, with Franklin "doing well-rehearsed pirouettes and dancing with most impressive agility and dignity. It was wonderful." Music was in abundance, of course. Jennifer Hudson, whom Franklin said she wanted to play her in a movie about her life, brought the crowd to its feet with a rousing "Amazing Grace." Ariana Grande sang one of the Queen's biggest hits, "(You Make Me Feel Like) A Natural Woman," and Faith Hill performed "What a Friend We Have In Jesus." The Aretha Franklin Orchestra opened the funeral with a medley featuring "I Say a Little Prayer," ''Angel" and other songs she was known for, along with such gospel numbers as "I Love the Lord" and "Walk in the Light." Gladys Knight segued from "You'll Never Walk Alone" to "Bridge Over Troubled Water." Near the end, Stevie Wonder brought the dwindling audience to their feet, swaying to his classic tribute to love, "As." "God bless, Aretha," Wonder said at the end of his song. "The joy is in knowing that she will have an eternal life of bliss." Jennifer Holliday ended the funeral with "Climbing Higher Mountains," an uptempo gospel original by Franklin herself. A statement from former President George W. Bush that was read to the crowd said Franklin would "continue to bring joy to millions for generations to come." The Rev. Al Sharpton read a statement from former President Barack Obama, who wrote that Franklin's "work reflected the very best of the American story." Sharpton received loud cheers when he denounced President Donald Trump for saying that the singer "worked for" him as he responded to her death. "She performed for you," Sharpton said of Franklin, who had sung at Trump-owned venues. "She worked for us." "She gave us pride. She gave us a regal bar to reach. She represented the best in our community," Sharpton said. Many noted her longtime commitment to civil rights and lasting concern for the poor. The Rev. Jesse Jackson recalled Franklin raising money for the Rev. Martin Luther King Jr. and urged attendees to honor her memory by registering to vote. Her friend Greg Mathis, the reality show host and retired Michigan judge, recalled his last conversation with her. They talked about the tainted water supply in Flint. "You go up there and sock it to 'em," she urged Mathis, paraphrasing the "sock it to me" refrain from "Respect." Franklin died Aug. 16 at age 76. Her body arrived in a 1940 Cadillac LaSalle hearse. 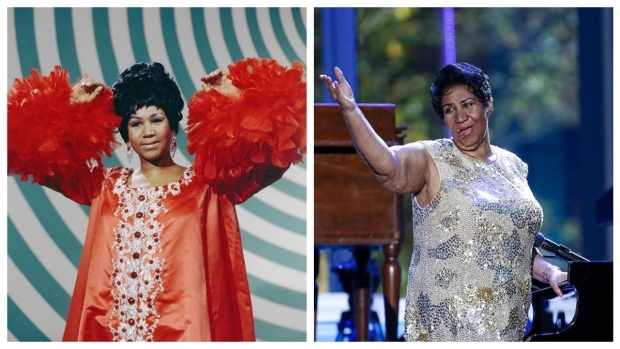 She wore a shimmering gold dress, with sequined heels — the fourth outfit Franklin was clothed in during a week of events leading up to her funeral. The casket was carried to the church that also sent Franklin's father, the renowned minister C.L. Franklin, to his and Parks' final resting place at Woodlawn Cemetery, where the singer will join them. Pink Cadillacs filled the street outside the church, a reference to a Franklin hit from the 1980s, "Freeway of Love." 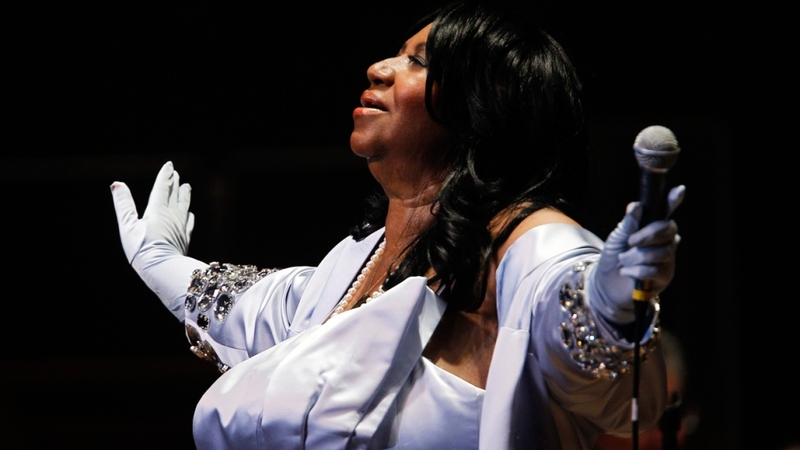 Detroit Mayor Mike Duggan announced during the service that the city would rename the riverfront amphitheater Chene Park to "Aretha Franklin Park." Family members, among them granddaughter Victorie Franklin and niece Cristal Franklin, spoke with awe and affection as they remembered a world-famous performer who also loved gossip and kept pictures of loved ones on her piano. "Nothing sounded better to me than my grandmother's voice," said Victorie. "Her voice brought peace." Aretha's son, Edward, sang "Mercy Mercy Me (The Ecology)" by Marvin Gaye. Grandson Jordan directed his remarks directly to Franklin, frequently stopping to fight back tears. "I'm sad today, because I'm losing my friend. But I know the imprint she left on this world can never be removed. You showed the world God's love, and there's nothing more honorable." Associated Press writers Josh Replogle, Nekesa Mumbi Moody and Andrew Dalton contributed to this report.